Technology: Metal Forging Services are metalworking processes which use hammering, rolling, and stamping to shape usually ferrous and non-ferrous metals. Forging is done mostly by mechanical means although some products are still hand forged. 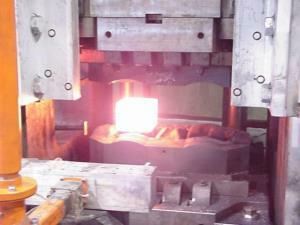 Most metals being forged can be hot or cold worked. Two principal forging methods are open and closed die forging. Open die forging produces simple shapes using multiple dies that do not enclose the parts, much like hand forging over an anvil. Closed die forging produces parts in dies that enclose the parts such that the material fills a cavity. Forging improves the strength of metal through the hammering process and is often used to produce parts that will see high stresses such as engine crankshafts. Advantages: Forging services are used to produce high strength parts in a variety of metals. Engine components, cranks, con rods, etc.